Underground water is one of the important sources of water in urban areas. With increasing urbanization, underground water has been indiscriminately exploited causing depletion in water table and water availability. It is very evident from the number of failing bore wells / open wells that it is unsustainable to pump out water from wells without recharging the same from the rainwater. To reverse the trend or to reduce the effect of over exploitation, ground water recharge need to be taken up in large scale at residential and institutional buildings. There are many methods of ground water recharge. Following are few methods for recharging ground water using rainwater from rooftops of buildings. d. How to build an Infiltration Gallery? This cost effective and simple method has been developed by A.R. Shivakumar. 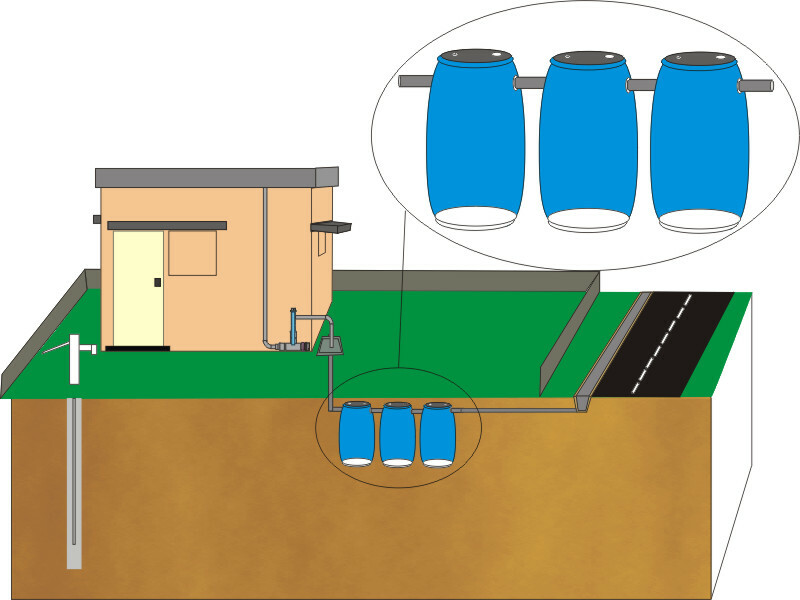 In this method, Overflow of rainwater from the storage structure and water from the roof other than the roof connected to the storage structure may be allowed to flow through a “PopUp Filter”. This filter will filter floating elements and to some extent the silt coming in the water. Relatively cleaner water comes out of the filter and is allowed to flow into ground water recharge gallery. The ground water recharge gallery is created by using reused plastic oil/chemicals barrels (blue colored drums sold on the road side for construction activities etc.). These barrels are of around 200 to 220lts. capacity each and are quite strong in their construction. One side of the barrel (top or bottom), which is circular in shape, is cut open. Depending on the total roof area connected to this infiltration gallery, more number of barrels are used for ground water recharge. The barrels are buried underground with their sides cut open facing down wards. These empty barrels are buried without filling anything into them. The top of the barrel, which is intact, should be two feet below the ground level. These barrels are placed one beside other and they are connected to each other at the top by a pipe. By doing so, these barrels are placed up side down under the ground at a depth of two feet from the surface. Outflow of the PopUp filter is connected to the first barrel in the row by a pipeline. Rainwater flowing from the filter flows into the first barrel, which is underground and its bottom cut open. Since the ground below the barrel is porous, water flowing into it infiltrates into the ground. During heavy rainfall, more water stores temporarily in the first barrel and over flows in to the next and later to subsequent barrels. As the height of the water increases in the barrels, percolation level also increases because of water head inside the barrels. In a system of barrels, first barrel in the row receives water and subsequent barrels are interconnected at the top to receive excess rainwater. Last barrel carries the overflow (if it happens) through a pipe into the storm water drain outside the plot. To facilitate the air trapped in the barrels to escape out, an air vent is provided at the last barrel by fixing a vent pipe (Overflow pipe can also act as an air vent). In the normal situation, where house is not located in low-lying area, (water stagnation during rainy season), one barrel is required to percolate water from a roof area of around 400 sq. ft. However, the percolation from each barrel depends on many other parameters like water table, soil structure, rainfall in the site etc. Process: Identify an open space around a building to create barrel system of infiltration gallery. Excavate earth to a depth of 6ft. from the ground level. The width of excavated pit must be slightly more than the diameter of the plastic reused oil barrel (around 1 ¾ ft. or 21 inches). Length of the excavated pit must be equal to number of barrels used multiplied by diameter. For example a four barrels infiltration gallery will have excavated pit of 21inch X 4no. = 84 inch or 7ft. length. Take required number of plastic barrels (each of around 200lts.) and cut open one side of all the barrels. Drill two holes at the bottom end on opposite sides with diameter slightly more than that of rainwater down pipe (4 or 5 inch as the case may be). Install empty barrels so prepared in the excavated pit with their cut open side facing downwards. Align all the barrels in one line with the side holes facing each other. Insert a pipe of 12inch length to interconnect two neighboring barrels. Guide the rainwater pipe connected to the outlet of the Popup filter to the first barrel. Connect a similar pipe as overflow to the last barrel and leave the outlet of this pipe to the drain outside the building. Make sure a cap with perforations is fitted to prevent rats or insects from entering the overflow pipe at the drain. Also make sure that the over flow pipe end is at a level above the normal water flow level in the drain. Fill up the excavated pit with soil leaving the barrels and the connecting pipes undisturbed. Once the soil over these barrels stabilizes, activities like gardening, cement flooring, light vehicle parking etc. can be taken up. Rainwater flowing from the Popup filter flows in to these barrel system of infiltration gallery and recharges ground water. Rainwater from the roof may be allowed to flow through PopUp filter and recharge ground water from an existing open well or a bore well. In case of an open well, filtered rainwater may be directly let in to the well through pipe from any one side of the well. Make sure the water pipe is slightly projected in to the well and a bend at the end of the pipe will guide the water downwards. This arrangement will avoid the water flowing on the wall of the well and subsequent damage to the wall. During heavy rainfall water level in the well raises and subsequently descends to maintain the ground water level. Wells can be built by digging the ground to the required depth (15 to 30 feet) and building the retaining wall around (preferably round) or by inserting cement rings to avoid caving in of the sidewall. It is advised not to allow the filtered rainwater from the PopUp filters in to the bore well (live or failed). Fine silt or dust from the roof may pass through the filter and block the micro pores or aquifers in the bore well causing permanent damage to the bore well. Rainwater from the filters may be allowed to stabilize in a storage facility or an infiltration gallery specially designed to inject rainwater in to the borewell. Infiltration gallery may be built next to the bore well, as explained in the section "Infiltration gallery for large buildings". The size of infiltration gallery can vary from 300 cft. to 800 cft. depending on the roof area. A perforated pipe needs to be installed in the second layer from the bottom from one end to the other. Farther end of the perforated pipe needs to be blocked with an end cap and the other end of the pipe is inserted in to the borewell by drilling the casing pipe of the bore well to the outside diameter of the perforated pipe. Make sure the perforated pipe is not projecting too much in to the borewell which will cause hindrance to install pump in to the bore well. At the same time if the pipe is not properly and firmly fixed to the casing pipe chances of silt/sand or other material may get an entry in to the bore well. Size of this pipe can be of 40mm or 1.5” diameter having 6mm holes (at an interval of 150mm or 6”) all along the bottom side of the pipe. It is important to have holes only at the bottom side of the pipe as shown in the figure to avoid fine silt entering the bore well. How does the direct injection of rainwater works? As the rainwater descends in the infiltration gallery, most of it gets in to the subsoil and recharges ground water. During heavy rainfall, rate of infiltration will be slower than the inflow of rainwater and the rainwater starts accumulating in the gallery. As the level of water increases in the gallery and rises above the perforated pipe level, clear and stabilized water enters the pipe from the small holes provided at the bottom of the pipe to reach the bore well. In this process fine silt, which escapes PopUp filters and sand bed at the top of infiltration gallery descends to the bottom of the infiltration gallery and settles down permanently. Clear and safe rainwater recharges the bore well aquifers to increase the yield and availability. It is advised to consult a professional before attempting to inject rainwater into bore wells. Increase in any of the above or both will influence greater infiltration of rainwater into ground. The level of infiltration also depends on the structure of the soil. How to build an Infiltration Gallery? Identify an open area around the building, and excavate earth to the required size, the excavated pit can be of rectangular or circular in shape. To support better infiltration and for convenience of excavation, the infiltration gallery can be of minimum 5 ft. and maximum 10 ft. depth and of similar width. Length of the Infiltration Gallery can vary to accommodate runoff water from the roof during heavy intensity rains. The excavated pit has to be filled layer by layer with material like pebbles, gravel, sand etc. These layers of different material will allow the rainwater to flow gently without much of turbulence and accommodate storing of rainwater temporarily. The sand layer will arrest silt coming in along with rainwater. To have a greater effect of the layers of different material, fill the excavated pit with soling or aggregate of large size to a depth of two feet. Fill the second layer with 40mm aggregate to a depth of one foot and the third layer with 20mm aggregate to a depth of one foot. Repeat the combination of 40mm and 20mm aggregate till 2ft. short of ground level (leaving 2ft. depth of pit empty from the top). Over the layer of the aggregate, spread a sheet of plastic / nylon mesh or net (mosquito net). Fill the balance of the infiltration gallery (top 2ft.) with coarse river sand. Build a boundary rim around the infiltration gallery with brick and cement masonry structure. This will avoid flow of water from the surrounding along with other impurities directly entering into infiltration gallery. All the material used in infiltration gallery like aggregate and sand need to be thoroughly washed to remove all silt and finer particles before filling into the infiltration gallery. Infiltration Gallery created underground should not be lined with plastic or brick and cement masonry or any other material, which will block the rainwater entering into underground aquifer. The bottom of the infiltration gallery should not be lined or rammed to create hard surface. All these attempts will block the rainwater entering into underground aquifer. The rainwater flowing from the building roof will be filtered in popup filter and canalized through pipes or cement lined channels to reach infiltration gallery. At the point of enter of rainwater in the infiltration gallery, splash pad may be laid to avoid splashing of water. Splash pad may be of rubber or plastic with perforation to hold water from flowing directly into sand. Water entering the infiltration gallery through sand bed will reach different layers of aggregates and start infiltrating into ground. The popup filter on the down comer pipe will arrest most of the impurities. The sand layer in infiltration gallery will arrest finer silt or dust coming along with rainwater. Different layers of material in the infiltration gallery will facilitate flow of rainwater gently into infiltration gallery without having much turbulence. During heavy rainfall, water flowing into infiltration gallery will be more than the water infiltration into the ground, thereby the water temporarily gets stored and the level of water in the infiltration gallery rises. With increase in the water head percolation level also increases. "Amruthavarshini - A guide for Rainwater Harvesting"
published by Karnataka State Council for Science and Technology.